Websites, tweets and emails, iPads, laptops and smartphones. All of these things have been daring to kill off paper yet look around your desk right now or open up your work bag. I bet you will find scraps of paper along with notepads and PDF print outs. 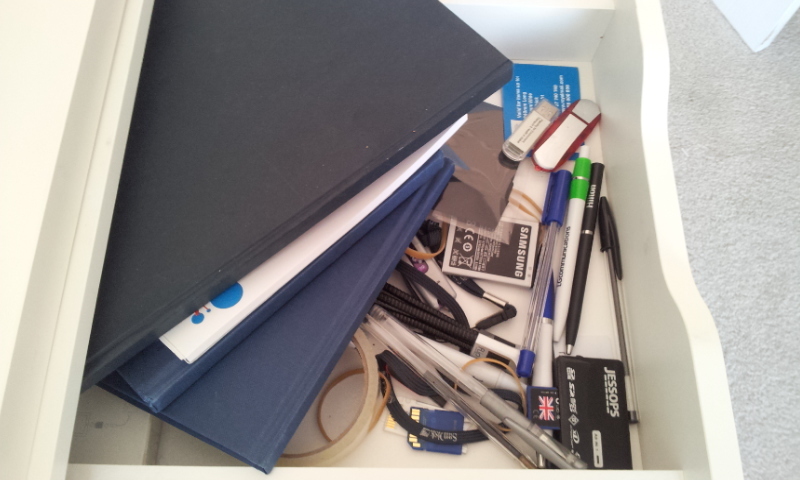 The top drawer of my home desk contains four notebooks and eight pens. That’s a lot of thoughts and notes in different places. The last time I felt organised with a notebook was when I worked as journalist. Spiral bound pads were tagged with the start and end date along with a summary of the stories they contained. Then they were popped in a box for safe-keeping. This was something to do with your notepad possibly being used in court one day. Gulp. Since then a mixture of bad handwriting and a habit of writing in whatever notepad I pick up meant things are a bit all over the place. The paperless office is pretty unlikely but how about a paperless person? Can you make changes to your day to day work to cut out the paper? 1) never carrying a pen and paper. 2) refusing to use paper. 1) having a system for dealing with paper (I haven’t got one yet but expect it to be along the lines of keep, recycle, shred, read, action, share etc). 2) setting aside time every day to follow this system at home and in work. 3) having fun trying out different ways of working until you find a system that works for you. This is my first post on going paperless. To help I’ve stumped up £35 for a year’s premium subscription to Evernote. This seemed like a reasonable investment for this experiment. The free Evernote product is very good but it felt right to put my money where my mouth is. Here is a quick video on Evernote. This entry was posted in Uncategorized and tagged blog, evernote, paperless on June 4, 2013 by Ben Black.